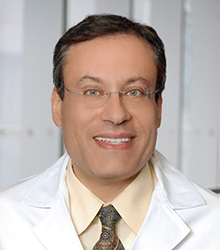 In 1996, Dr. Nagueh joined the Section of Cardiology in the Department of Medicine at the Baylor College of Medicine as an Assistant Professor. He was promoted in 2001 to an Associate Professor, and became the T.L.L Temple/William H. Spencer, MD Chair in Clinical Cardiology there in 2004. Dr. Nagueh assumed his positions at Houston Methodist in 2005. Dr. Nagueh´s research career has been in the field of echocardiography. He has authored or co-authored over 100 manuscripts in peer reviewed journals and four book chapters. His research interest has been in the evaluation of diastolic function with tissue Doppler and its application in hypertrophic cardiomyopathy, particularly in patients undergoing alcohol septal ablation.